Image: @mikeVSphilly. Report submitted by reader Richard Kelly. 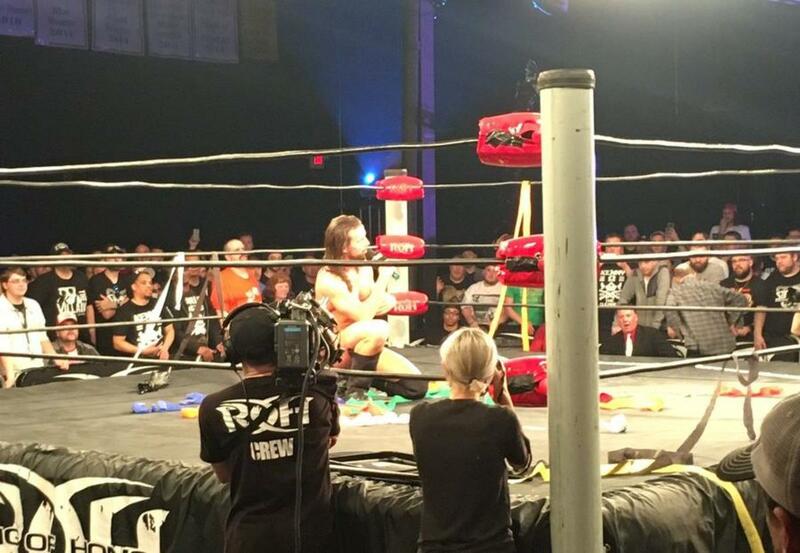 ROH concluded its War of the Worlds tour on Sunday night at the 2300 Arena in Philadelphia, Pennsylvania. Four television episodes were taped, including the 300th episode. - The show opened with The Young Bucks and Hangman Page doing a promo. They introduced Marty Scurll as the new Bullet Club member. Scurll said Adam Cole never saw it coming. Cole came out and said Bullet Club has a new enemy. Hangman Page challenged him to a match and Cole accepted. I think Starr was supposed to be a heel and Woods was supposed to be a face, but the crowd hated Woods and loved Starr. Starr was much better and Woods still has a little ways to go. Woods won with a rolling kneebar. - Silas Young and Beer City Bruiser called out Jay Lethal. Lethal wanted a fight with Young, but he got a match with Beer City Bruiser instead. This was a decent match. Lethal had his knee taped up here from the moonsault onto the figure four at the War of the Worlds PPV, but he didn't later on so it was probably a storyline injury. Lethal ended up on the outside, where Young (who was on commentary) started brawling with him for the DQ. Young and Bruiser teamed up on Lethal until Bobby Fish made the save. - Cody came out for a promo. He said he had Lethal's shoulders pinned to the mat in the figure four at the PPV, so he should be champion and wants to face Christopher Daniels. This was a good TV main event, with Cody winning after hitting Cross Rhodes. Hangman Page came down and they beat up Kazarian until Daniels made the save. It was weird that this had the same angle as the last match. The fans were chanting "Please don't die" before the match started. The smaller guys got a little bit of offense and made a small comeback, but the match was mostly War Machine destroying the two of them. War Machine did the Meng/Barbarian backdrop into a powerbomb spot, but Cheeseburger kicked out and the place went crazy. War Machine then hit the pop-up powerslam to win. They called out The Young Bucks and said they want the ROH tag titles. This was pretty insane. Naito was mega over with basically everything he did the entire match. There was a lot of comedy with him and Bully Ray at the start. It eventually broke down into a big eight-man brawl. Bully Ray did the "Get the tables" chant and went outside to look for tables, but while he was out of the ring, the Boys did something accidentally to Jay Briscoe and BUSHI hit him with the mist and cradled him for the flash pin. Jay was livid with Castle and the Boys after the match and they argued to the back. Naito did his big LIJ post-match promo and the crowd loved it. They had a really good match. It went back and forth and there were a lot of crazy near falls towards the end. Cole went for the Panama Destroyer, but Page caught him and hit the Omori Driver. He then hit it again to win. Page took off Todd Sinclair's belt and started whipping Cole with it, but Kazarian came out to make the save. Cole started to have his moment again, then Scurll interrupted him and said it's them two in a Philadelphia street fight in the dark match main event. - The Young Bucks and Hangman Page entered. Roppongi Vice then made their way out, saying they have a third man. Trent Barreta said it's his real best friend, and it's the Kentucky Gentleman Chuck Taylor! The place went crazy. This was another insane match. It was basically modeled after a Young Bucks six-man in PWG. There were tons of insane moves and spots. Dissension was teased between Rocky Romero, Barreta, and Taylor, but they were all unified by the end. The ending came when the Bucks were superkicking everyone and went to finish off Taylor with the Meltzer Driver, but Taylor hit the Awful Waffle and pinned Matt Jackson. The babyfaces all hugged after. White got more of a reaction here than previously, so the match against Will Ospreay at the War of the Worlds PPV probably turned some heads. This was an okay match, with Kenny King making his return and interfering for the DQ. Alex Shelley and Chris Sabin ran in and there was this huge crazy eight-man pull-apart and security guards were getting wiped out left and right. They set up Search and Destroy (Sabin, Shelley, Gresham & White) vs. The Rebellion (Taylor, Titus, King & Coleman) at the next PPV where the losing team has to disband. They had a good TV main event, though it wasn't on the upper-tier level that these two could probably do. There was a lot of technical work with the arms for both guys, along with some good submission teases. Scurll set up for the chicken wing until the lights went out. When they came back on, Cole was on the apron in Scurll's ring gear with the jacket and creepy bird mask. Scurll was distracted, then KUSHIDA hit a tornado DDT and a small package driver to win the TV title. Another okay match here. There was some comedy with Bruiser where they made him run the ropes and he got blown up several times. It eventually got into a two-on-one where Lethal hit Bruiser with the Lethal Injection, but Young caught him with the TKO and pinned him. TK O'Ryan was out on crutches. They beat down the Boys before the match started. It seemed like they were getting revenge on the Boys because they were their opponents when O'Ryan got injured. There wasn't much to the match. Jay Briscoe ran down to confront Castle, with Bully Ray and Mark Briscoe having to pull him back. Martinez won with a sit-out chokeslam in about a minute. Cheeseburger and Ferrara came down before being destroyed by Martinez. Jay White then made the save and ran him off. Ospreay was super over, I'd say more so than Tanahashi. This wasn't as crazy as the Bucks match from earlier, but it was a very fun six-man. Gedo and Daniels did some comedy, teasing that Daniels was Curry Man. Daniels eventually pinned Gedo after Tanahashi hit a High Fly Flow and he hit the BME. Cody was on commentary and him and Hangman Page attacked Daniels and Kazarian after. Page kept whipping Kazarian and Cody laid out Daniels with the title belt. This was taped for the ROH website, probably as a VOD or something. It was a fun match with some comedy and brawling. Scurll tried a One Winged Angel and the Styles Clash, but Cole countered and instead hit a Bloody Sunday DDT for the Bullet Club leader homage. The Young Bucks ran down and laid out Cole, but he was able to fight them off and double superkicked them off the apron and through a table. Cody ran in and tried the old school powder spot before getting it knocked back in his face. Finally, Scurll had Cole on the ground. He blasted him with superkicks and umbrella shots. Cole gave him the double middle fingers and Scurll broke both fingers, did some elbows, then knocked him out in the chicken wing to win. Cole gave a speech to the fans after the match. He said ROH was what made him fall in love with wrestling, and no matter what happens, ROH will be his home.